This week, electric vehicle manufacturer Rivian took the wraps off its R1T, an all-electric pickup, and the R1S, a seven-seat all-electric SUV, both aimed at outdoor enthusiasts. The R1T, a five-passenger pickup truck, and the R1S are based on the company’s skateboard platform, which packages the battery pack, drive units, suspension, braking and thermal system all below the height of the wheel, leaving the space above for occupants and their gear. The two vehicles share 90% of the same components, including the skateboard, which helps drive cost savings by minimizing the complexity between the two models. Both vehicles will be produced at Rivian’s manufacturing facility in Normal, Ill., with the R1T starting at $61,500 after a federal tax credit. The R1S starts at $65,000 after the tax credit. Deliveries are planned to start in late 2020. Fully equipped vehicles offering the highest performance level and largest battery pack will enter production first, according to a company release. The two vehicles will launch with a hardware suite boasting camera, Lidar, radar, ultrasonic and a GPS sensor coupled with HD maps, enabling Level 3 autonomy for highway operation, where the vehicle can handle most aspects of driving under certain conditions. 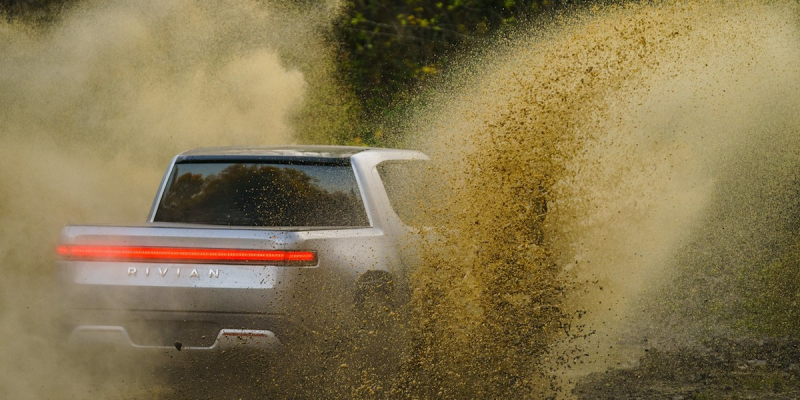 The R1S and R1T also boast safety systems enabled by Rivian’s suite of self-driving sensors, while the battery module and pack incorporate underbody plating for off-road protection. Further protective measure includes an advanced cooling system to make the vehicles suitable for more types of terrain or temperature. The battery is designed for fast charging with charging rates of up to 160kW, enabling approximately 200 miles of range to be added in 30 minutes of charging. In addition to offering a DC fast charger, which is designed to charge electric vehicles quickly and boasts an electric output ranging between 50kW and 120kW, the two vehicles provide an additional Level 2, 11Kw charger. Three battery sizes are planned, with the 180 kWh and 135 kWh available at launch and a 105 kWh being made available within six months. In addition, adaptive control algorithms learn driver behavior, optimizing user-specific battery management for maximizing battery life, reliability and second-life reusability. The system sounds similar to the one Lexus developed for its 2019 UX SUV, which boasts predictive deceleration support that learns from the driver’s behavior in order to anticipate slowing and stopping patterns. The Rivian operating system is connected to a high-speed Ethernet backbone, which supports over-the-air updates of vehicle software. In addition, the vehicles will connect to a cloud-ecosystem for data exchange and processing, enabling machine learning and data services. This extends beyond the vehicle into the cloud ecosystem and mobile and web apps to offer an interface for vehicle status and control. The cabin is dominated by a 15.6-inch center touchscreen as well as an 12.3-inch instrument cluster and a 6.8-inch rear touch screen, which display Rivian developed maps, music and navigation features geared towards those seeking off-road experiences. The two vehicles feature tons of lockable storage space. The R1T boasts a Gear Tunnel aft of the cab, which extends across the vehicle and provides more than 350 liters of space, while the second and third row seats of the R1S fold flat to provide room for any gear required. Rivian employs 450 people with vehicle design and engineering operations in Plymouth, Mich.; technology and engineering operations in San Jose and Irvine, Calif.; and manufacturing facilities in Normal. The company’s investors include Japanese conglomerate Sumitomo, London-based international banking group Standard Chartered, and Saudi conglomerate Abdul Latif Jameel.